Ink and color on paper mounted on silk paper. This painting can be found on the 2nd floor. Po Chung is an alumnus of Humboldt State University (class of 1969) and a recipient of the 2005 Distinguished Alumni Award. Mr. Chung and his wife Helen reside in Hong Kong. Mr. Chung graduated with a degree in fisheries management, returned to Hong Kong, joined DHL Express, and co-founded its Asia Pacific division. A doyen of international trade, an accomplished painter, and a cosmopolitan patron of the arts, education, and conservation. Mr. Chung is equally committed to community service and civic progress. He has held top ranking posts with the Hong Kong Trade Development Council, Hong Kong Art Center, World Wildlife Fund, and Ocean Park Conservation Foundation. During his acceptance speech at the Distinguished Alumni Awards ceremony he said, "for me, Humboldt State was not a logo, not a campus, nor a degree. It was and is a collection of people--a collection of warm, kind, considerate, and generous people who did everything they could to help me in my times of struggle." What he gained at HSU and took back to Asia, he said, "was an understanding of the dynamics of the individual, the dynamics of the flock or herd, and the dynamics of the ecosystem. I put that understanding into practice in the business domain." As for the future, Mr. Chung concluded, "Humboldt State already has all the ingredients in people, knowledge, and conceptual understanding. All we have to do now is to look at the old ingredients with new eyes, and we will have a new wisdom, a new vision with a new positioning and, as a result, a new university for the new century All you need is to integrate these assets of yours." 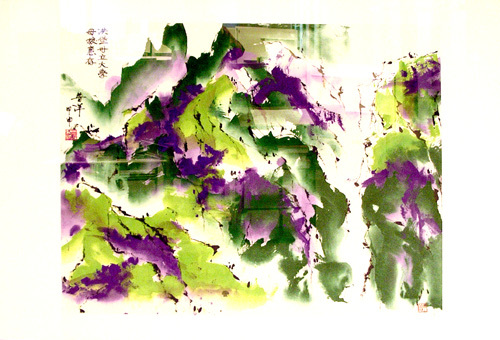 In 2004 collections of his unique mountainscape paintings were exhibited in Hong Kong and Paris.